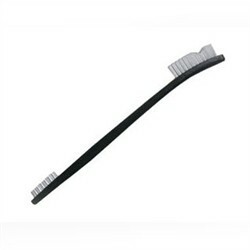 The Dual Purpose Toothbrush Style Detailing Brush is the most versatile brush for cleaning the toughest, smallest areas. Clear polypropylene bristles are heat-set into a heavy duty polypropylene handle for professional long lasting durability. Uniquely designed polypropylene handle will not crack or absorb water and is treated to deflect odor and mildew. Hundreds of bristles provide just the right amount of heavy duty scrubbing that is still gentle enough for both interior and exterior purposes. From the tightest and smallest of areas to the hardest to reach crevices, this brush removes dust, dirt, crumbs and gunk. Soft customer designed gentle bristles reach between small areas to lift and remove particles. This brush can even remove wax and polish residue - especially around emblems, molding, trim, door handles and more.